Rana Pratap Singh ~ Amazing ..!! Rana Pratap Singh(Born: May 9, 1540- January 29, 1597), a Rajput king who fought for his mother land against the mughals for a long time. He protested the occupation of Mewar and never surrendered to the greatest armies of Mughals. He used to fight with a spear in his hand and he is famous for it. In 1567, when Crown Prince Pratap Singh was only 27, Chittor was surrounded by the Mughal forces of Emperor Akbar. Maharana Udai Singh II, father of Rana Pratap singh decided to leave Chittor and move his family to Gogunda, rather than capitulate to the Mughals. The young Pratap Singh wanted to stay back and fight the Mughals but the elders intervened and convinced him to leave Chittor, oblivious of the fact that this move from Chittor was going to create history for all times to come. In the year 1572, Pratap Singh had just become the Maharana of Mewar and he had not been back in Chittor since 1567. His old fort and his home beckoned to him. The pain of his father's death, and the fact that his father had not been able to see Chittor again, troubled the young Maharana deeply. But he was not the only one troubled at this time. Akbar had control of Chittor but not the kingdom of Mewar. So long as the people of Mewar swore by their Maharana, Akbar could not realize his ambition of being the Jahanpanah of Hindustan. He had sent several emissaries to Mewar to get Rana Pratap to agree to sign a treaty but the letter was only willing to sign a peace treaty whereby the sovereignty of Mewar would be intact. In the course of the year 1573, Akbar sent six diplomatic missions to Mewar to get Rana Pratap to agree to the former's suzerainty but Rana Pratap turned down each one of them. The last of these missions was headed by Raja Man Singh, the brother-in-law of Akbar himself. Maharana Pratap, angered that his fellow Rajput was aligned with someone who had forced the submission of all Rajputs, refused to sup with Raja Man Singh. The lines were completely drawn now - Akbar understood that Maharana Pratap would never submit and he would have to use his troops against Mewar. In preparation for the inevitable war with the Mughals, Maharana Pratap altered his administration. He moved his capital to Kumbhalgarh, where he was born. He commanded his subjects to leave for the Aravali mountains and leave behind nothing for the approaching enemy - the war would be fought in a mountain terrain which the Mewar army was used to but not the Mughals. In his self-inflicted state of penury, the Maharana lived in mud-huts made from mud and bamboo. After 1587, Akbar relinquished his obsessive pursuit of Maharana Pratap and took his battles into Punjab and India's Northwest Frontier. Thus for the last ten years of his life, Maharana Pratap ruled in relative peace and eventually freed most of Mewar, including Udaipur and Kumbhalgarh, but not Chittor. " 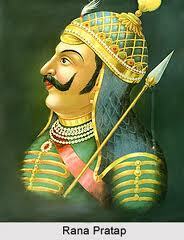 Maharana Pratap became a patron of the Arts. During his reign Padmavat Charita and the poems of Dursa Ahada were written. Palaces at Ubheshwar, Kamal Nath and Chavand bear testimony to his love of architecture. These buildings, built in the dense hilly forest have walls adorned with military-style architecture. But Pratap's broken spirit overpowered him in the twilight of his years. His last moments were an appropriate commentary on his life, when he swore his successor, Crown Prince Amar Singh to eternal conflict against the foes of his country's independence. 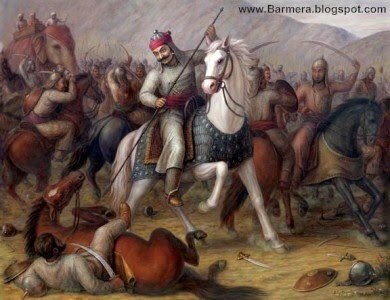 Maharana Pratap was never able to win back Chittor but he never gave up fighting to win it back.